Inspired by a funny conversation I had a few weeks ago, "How to be Miserable" is a new series here on Family Volley. Each week I will post one way to be Miserable. To help us remember how to be Happy. 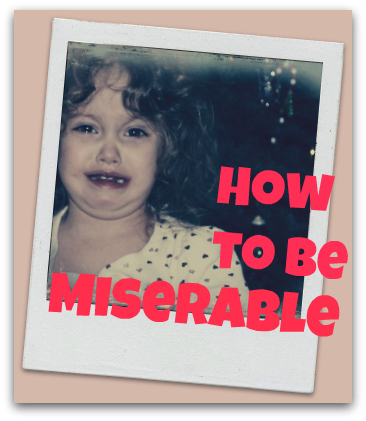 If you want to be miserable, don't smile. Smiling makes us more attractive, changes our mood, relieves stress, makes us look younger, boosts our immune system and helps us stay positive. Who would ever want those things to happen? Plus, a smile is contagious. So by all means, if you want to be miserable, don't smile, and don't hang out with people who smile either. You might catch something. The Challenge: Smile today, even if you don't feel like it. My ex dumped me because he’s been talking to someone else (even when we were still living together). The problem is I was 6 months pregnant with his baby, so it maked it that much harder for me to move on. I knew I treated him like sh*t throughout our relationship, but I learned my lesson and I wanted him back. I order love spell from her website http://magical-rituals.com , I was waiting 3 months, and my lover back to me.